Rugs and floor coverings Rug pattern: Lunar Dimensions: 6' x 9' Fiber content: Wool Construction: Hand-Tufted Color way: Indigo Dust Since Schumacher was founded in 1889, our family-owned company has been synonymous with style, taste, and innovation. A passion for luxury and an unwavering commitment to beauty are woven into everything we do. Schumacher's sister-brand, Patterson Flynn Martin, is a leading designer of exquisite custom, classic and contemporary floor coverings serving the interior design trade. Since its founding in 1943, the company has maintained a reputation for its dedication to superior design and personalized service. Only the finest floor coverings crafted with exceptional production techniques become part of PFM’s offerings, which include historic reproductions, Oriental carpets, exclusive Wilton, Hand Tufted, Tibetan and Hand Knotted rugs from around the world. Hand-knotted un-dyed wool Tibetan rug with all-over geometric design. 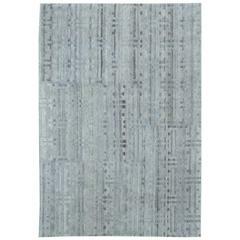 A hand-knotted un-dyed wool Tibetan rug with all-over geometric design. Terra rug in natural wool Size: 4'10" × 7'6" (147 × 228 cm). Hand knotted un-dyed wool Tibetan rug with all-over geometric design. Rug wool China hand knotted blue en yellow.